Last week I had the good fortune of being given a whole lot of fresh mint. With the heat wave we've been enduring here in Virginia, my mind went right to ice cream - and my personal favorite flavor: mint chocolate chip. Blackberry comes in a close second, but mint is really my favorite. 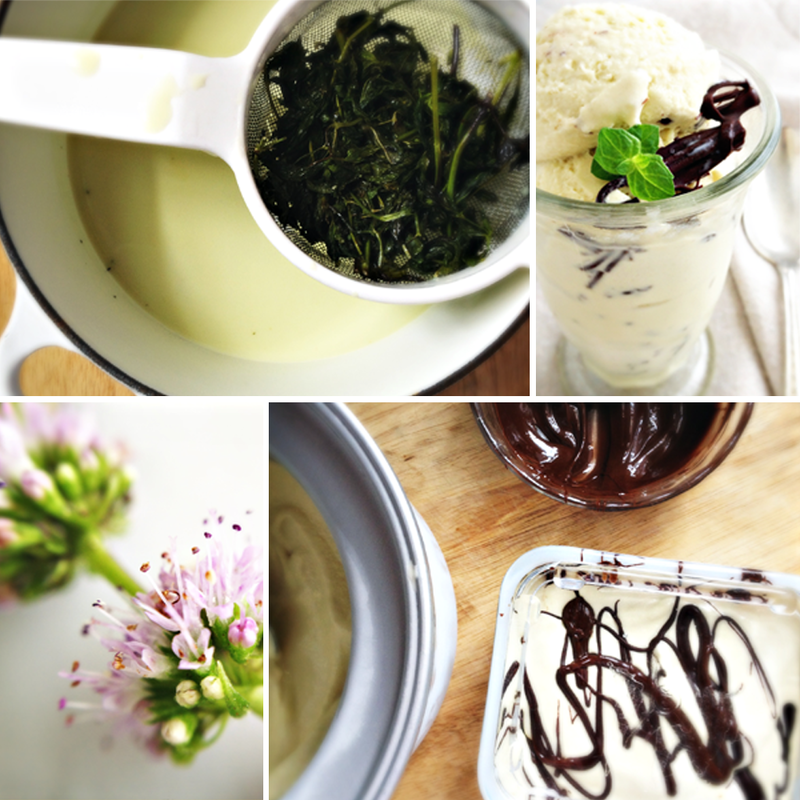 Here's how I made some really good ice cream. The recipe is based on one developed by David Lebovitz's (which can be found on his website). Even with the hordes of mint I had it still didn't come to 2 cups (80 grams) as David's recipe calls for, so I scaled back all of the ingredients based on the amount of mint I did have (50 grams). 1. In a medium saucepan, place the milk, sugar, 5.5 ounces of the cream, salt, and mint. Gently heat the mixture just until you see steam rising from the pan. Cover, remove from heat, and let steep for one hour. 2. Using a strainer, pour the mint and cream mixture into a large bowl. Use a spatula or your hands (if mixture is cool enough) to squeeze the mint of as much liquid as possible into the mixture. 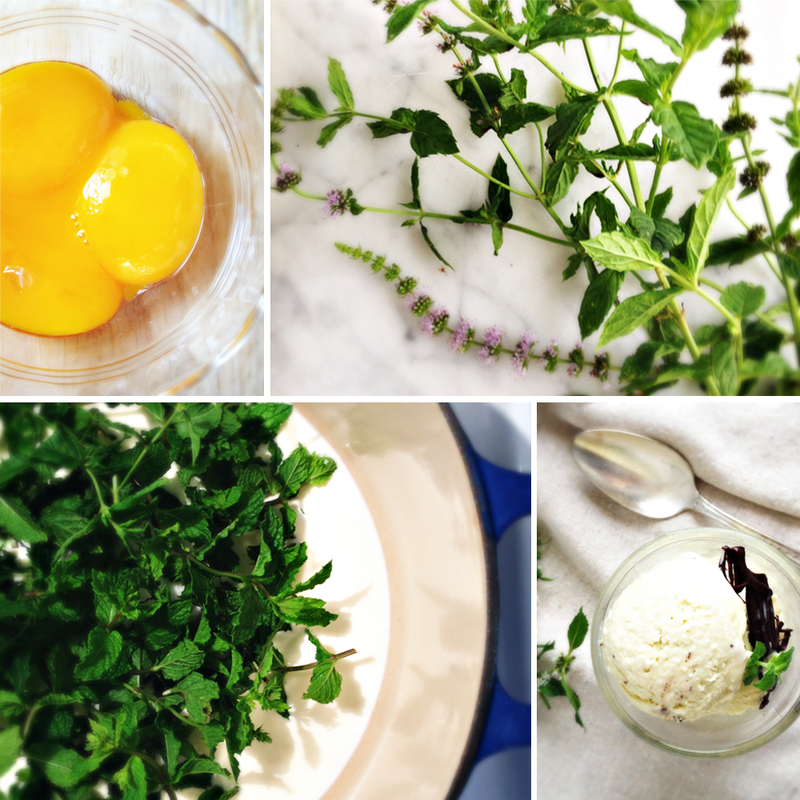 Ensure that all pieces of mint have been strained. Return the mixture to the pan and discard the mint. 3. Pour the remaining 5.5 ounces of heavy cream into a medium sized bowl and place a strainer on top. 4. Gently warm the infused mint mixture again. While the mixture is warming, lightly whisk the egg yolks. 5. Pour a 1/4 cup of the warm cream mixture into the eggs and whisk to incorporate. Then, add the egg mixture into the infused mint mixture and whisk to combine. 6. Cook the custard over medium heat - stirring constantly - until the mixture becomes thickened and coats a spatula. Strain the mixture into the reserved heavy cream and stir. Cool the mixture over an ice water bath. 7. Refrigerate the mixture for several hours (preferably overnight). 8. Prepare your ice cream maker. Place the custard into the bowl of the ice cream maker and process according to the manufacturer's instructions. 9. While the ice cream is processing, melt 90 grams of chocolate chips in the microwave or in a double boiler. 10. When the ice cream is ready, drizzle some of the melted chocolate into the bottom of the container in which the ice cream will be frozen. Add a layer of ice cream (using about a third of the mixture). Continue layering drizzled chocolate and ice cream in two more layers each. 11. Cover and freeze ice cream for several hours (or overnight) prior to serving. You may be aware already that nominations for the 2013 Blog Awards Ireland are open. Last year, so many fantastic blogs were spotlighted through this event. This year, they've expanded the categories to include one for Best Blog of the Irish Diaspora. That means Wee Kitchen is eligible! I would be so thrilled if you'd consider casting a vote for my blog in the Diaspora category. If you're so inclined, just click here and you'll be taken to the page which has the information you'll need. The deadline is July 31, so hurry on over! and, THANK YOU! There a lots of other categories for blog authors who reside in Ireland, so be sure to nominate your favorites in those categories, too! I hope you enjoy this ice cream as much as I did. Oh, I forgot to include one ingredient! I spiked mine with 2 tablespoons of Bailey's Irish Cream. It was a sublime addition to an already dreamy ice cream. Photos by me...and all from my iPhone!